"Welcome to Torval, home of the finest southern wines. Be wary of our market, for those who have crossed the merchants' path have been in dire straits indeed..."
Torval is a city-state located in southwestern Elsweyr, near the border of Valenwood. The ruler is King Mojtabe. Its rival is Corinth. 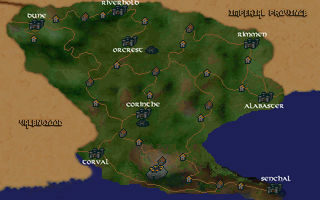 Torval is a possible starting location for Khajiit. This page was last modified on 3 February 2019, at 12:20.